EU member states have today agreed to impose sanctions on the Gaddafi regime. The decision follows on from a UN Security Council Resolution adopted over the weekend. Italy, who only a few days ago strongly rejected talk of sanctions, has apparently backed down with Italian Foreign Minister Franco Frattini saying that the Libyan crisis has reached “a point of no return”. It is “inevitable” that Gaddafi steps down, he added. a ban on the supply to Libya of arms, ammunition and "equipment which might be used for internal repression". a ban on 26 individuals from entering the EU, including Gaddafi, his closest family and a handful other people associated with the regime. a freeze on the assets of Gaddafi, members of his family and ten other individuals. 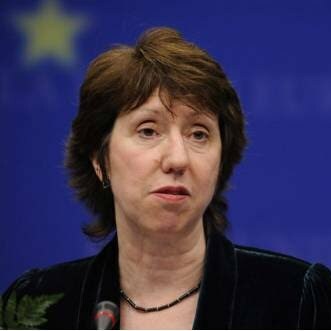 EU Foreign Policy Chief Catherine Ashton also said that the "complex issue" of creating a no-fly zone over Libya is being explored by EU and world leaders. UK PM David Cameron just gave a statement before the House of Commons, setting out the UK's role in the sanctions. In other words, following a slow start EU countries are now picking up the pace. The pro-democracy protests in Libya and the subsequent violent crack-downs by Gaddafi, kicked off on 15 February. It took the EU roughly two weeks to reach a common position on some form of concrete measures. That isn't exactly acting with the speed of lightening, but given the complexity of the situation, it could've taken them a lot longer as well (after all, EU member states are still disagreeing fundamentally on how to deal with Cuba). What's clear is that the EU institutions themselves - such as the External Action Service - have added very little value to Europe's response to the unrests in North Africa. As ever, what was needed was political will, not institutions. Now, a common EU policy isn't a goal in itself - a fallacy that EU federalists consistently commit (see Romano Prodi in today's Handelsblatt for an example). What matters is real policies and outcomes. And these sanctions could hurt Gaddafi in a real way if implemented in full, though we shouldn't overestimate their importance either. Cutting off the links to what quite clearly is a Mugabe-type dictator shouldn't be that controversial (we're not talking intervention after all). A bigger challenge, however, might be around the corner if the violence in the region escalates and there are calls for something more. A separate, but related, challenge is the growing calls for a common EU policy on immigration and asylum, in the wake of the unrest in North Africa and the potential flow of people from that region. This is an uber-controversial policy area which in the past has split Europe right down the middle. One challenge down, many to go. The EU won the 2006 and 2010 World Cups in football (at least according to Romani Prodi and Jean-Claude Trichet, so it has to be true). It also won the 2008 Olympics, according to highly credible EU-funded sources. Now, it has upped its game yet another notch and raked in the film world's greatest prize - an Oscar. "What a great night for the European film industry and the Media programme. Europe loves cinema and the world loves our films. This shows that the European film industry can compete with the best." After such an accomplishment, all eyes now turn to Euro 2012 (the football tournament, not the currency), where we're told the EU has an excellent chance of repeating its record of success. The EU's Gaddafi "memory hole"
Everyone who has read George Orwell's novel 1984 is familiar with the concept of "memory holes", which the Ministry of Truth used to get rid of inconvenient documents and photographs. Well, it seems as if the EU has picked up on the idea. 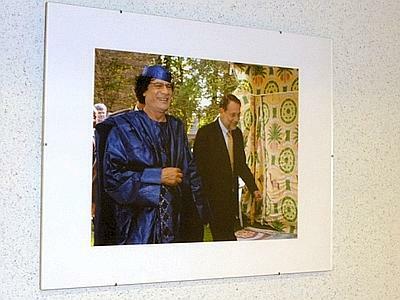 Apparently, a picture (see above) hanging in the European Council's Justus Lipsius builiding in Brussels, featuring a grinning Moammar Gaddafi (the Libyan leader) happily walking alongside a smiling Javier Solana (the former High Representative for EU foreign policy), has now been removed (hat-tip: Italian journalist Marco Zatterin and his Straneuropa blog). We suspect that the Dictator's rambling speeches and brutal attacks on his own people made the photograph lose some of its appeal. Why in the world it was considered so appealing in the first place so as to merit a place on the wall of one of the EU's most sacred buildings is of course an interesting question in itself. At least Solana didn't try to imitate Italian Prime Minister Silvio Berlusconi, who once was caught on camera kissing the Libyan Rais's hand. 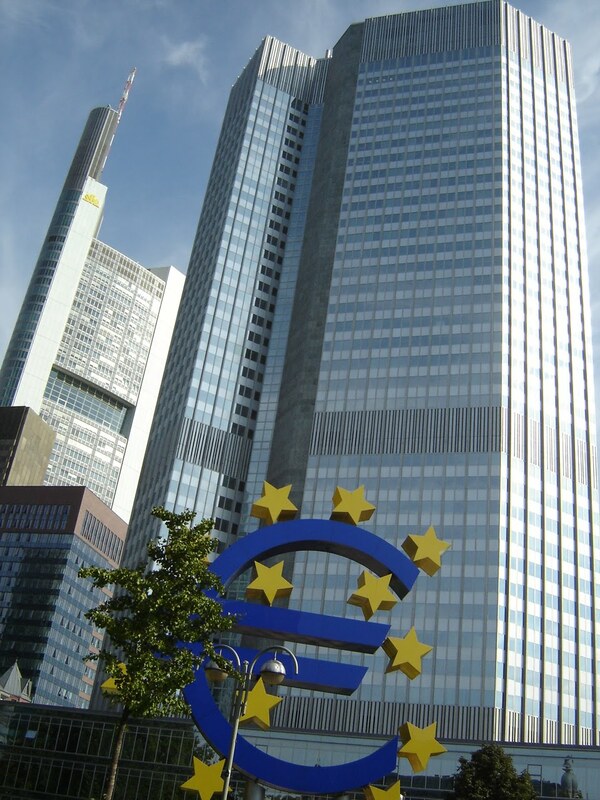 The "European Economic Advisory Group", CESifo, is a joint venture by two of Germany's most respected research institutions. Earlier in the week, it published an interesting report examining the various potential policy responses to the eurozone crisis. One of the authors is CESifo Director and heavyweight economist Dr. Hans-Werner Sinn (pictured). When he speaks, Germany listens. The persistent flow of public funds has in the end helped eastern Germany only a little, if at all. It has made it another European Mezzogiorno – a region stuck in a low-development equilibrium. Whether the EU budget should be expanded for this purpose is a distributional question that will have to be decided by the political process. Politicians should not overlook, however, that there is the risk of Greece becoming addicted to the transfers, since it seems to have become addicted to the capital flows of the past. The Italian Mezzogiorno has been caught in such an equilibrium for half a century and more. Its GDP per capita is about 60 percent of that of the rest of Italy and does not show any sign of convergence. In Italy, the causes for this situation can be sought in a common wage policy, mainly dictated by the conditions of the North, which has always resulted in wages that were way too high for the South and resulted in persistent mass unemployment. The under-development has forced the state to help out with transfers from the North. These transfers have provided an alternative income source in the South to which the political system and the economy have grown accustomed, perpetuating the situation, as it seems, even more. They also explore the alternative to a transfer union - devaluation. There's a distinction between internal and external devaluation. The former means tough austerity measures and squeezes on wages and jobs at home, as in Latvia (whose economy, as CESifo notes, shrunk by 19 percent in 2009). The other option is external devaluation, which would involve Greece leaving the eurozone. From page 118 onwards, the report looks at such a scenario, with special focus on Greek banks. They note that if Greece did decide to leave the eurozone there would undoubtedly be a bank run, amongst other problems, therefore the ECB would probably need to guarantee all Greek bank deposits. As Greek banks are net borrowers abroad and net lenders at home, the external depreciation will probably hurt them by shrinking the eurovalue of their assets more than shrinking the eurovalue of their liabilities. However, this analysis forgets the additional write-off losses on claims against the companies of the real economy that will be driven into bankruptcy after an internal depreciation. If these write-off losses are taken into account, it is not clear whether banks fare better after an internal depreciation than after an external one. It is only clear that companies of the real economy will fare better after an external depreciation. In view of these uncertainties in the analysis, the EEAG has decided not to opt for a particular policy alternative but only to inform policymakers of the relevant arguments. Definitely, there is no alternative that clearly dominates the other in all dimensions. This is not a call for Greece to leave the eurozone, but the distinguished economists are clearly toying with the idea - though stressing that every scenario involves huge costs. collectivising the debt of member states, which leads to higher taxes and higher inflation in the EU as a whole. It's not getting any easier for Angela Merkel. The bulk of the cost of regulations in both the UK and Europe stem from the European Union, as we've showed in our extensive research on the subject. But this isn't even the end of the story. Many key decisions on the actual substance of EU laws and regulations are being taken during an uber-opaque process called “Comitology”. As we've noted before, Comitology involves special committees consisting of Commission and national experts deciding on how EU legislation should be implemented - usually behind closed doors - after the proposal has been agreed by national governments and the European Parliament. 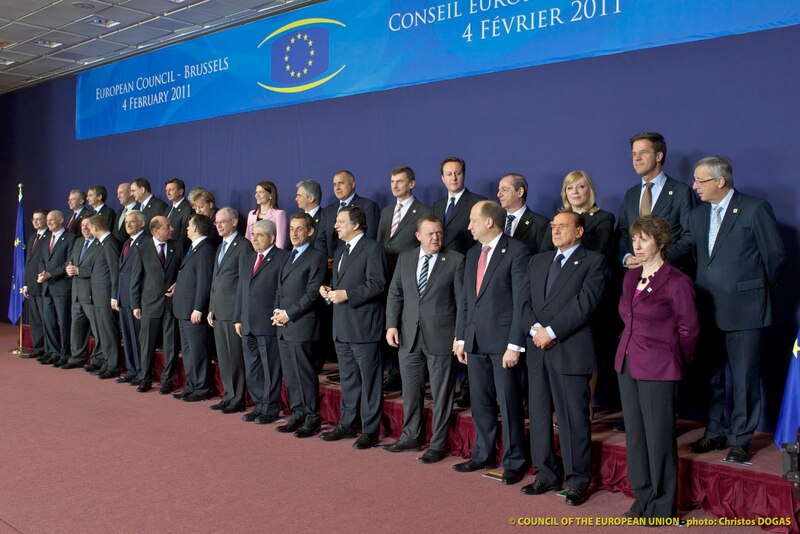 The Lisbon Treaty - the document, if you remember, that would lead to more transparency in Europe - is introducing new rules for the Comitology procedure, effective from 1 March 2011. The new rules were meant to improve and simplify the system, but are now universally acknowledged to have made the situation even worse (we explain why here). I must admit that for the general public the new rules are a step back for transparency...Hundreds of thousands of decisions will be taken by these Treaty articles every year. Apart from the complexity and opaqueness of the new rules, Euractiv reports that the reforms are also causing legal uncertainty. 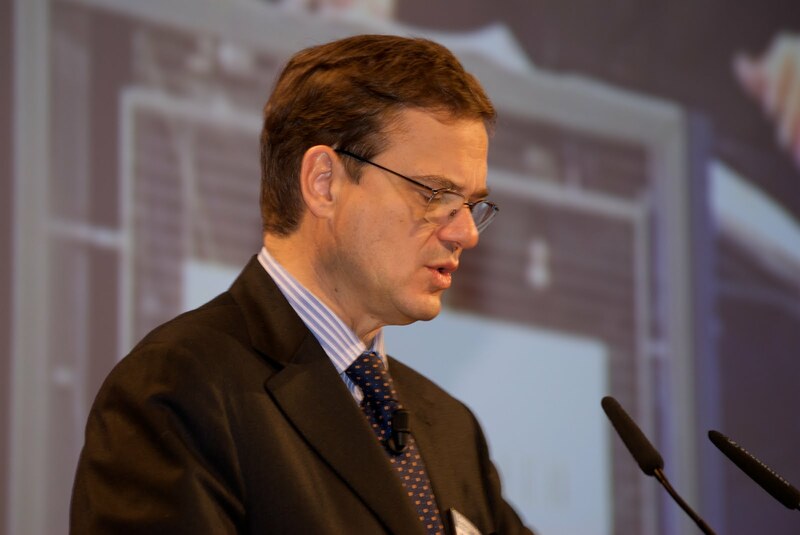 According to Wolfgang Heusel, director of the Academy of European Law (ERA), this means that "courts will have to have the last word" on how EU legislation should be implemented. Does this matter? Absolutely! As much as 50% of the actual substance of all EU rules is decided during the comitology stage after the law has already been agreed by Ministers and MEPs, according to Dutch academic research. So we're not talking about fixing little details. Are the Coalition and other governments around Europe keeping up? We fear not. Ahead of the last General Election, Ken Clarke (then Shadow Business Minister, now Justice Secretary) managed to give an entire key note speech on regulation and how to improve it, without mentioning the EU once. Il faut le faire, as the French say. Over on the Spectator's Coffee House blog, we set out the case for imposing sanctions on Gaddfi's regime (while also looking at the difficulties EU member states are facing in coming up with a common policy on Libya, in what is a painfully familar story). The EU spends €460 million a year in operational costs alone on its new foreign policy department, the External Action Service, headed up by Catherine Ashton. This body - created by the Lisbon Treaty - was Europe’s ‘great white hope’ for the global stage, finally allowing it to speak with one voice and therefore giving it leverage where it previously had none. It hasn’t quite worked out that way. Caught between Cairo and Tripoli, the EU has received yet another reminder that its bureaucracies and institutions cannot magically replace 27 individual foreign policies, as EU leaders continue their bickering over what to do. The EU’s response to the turbulence in Libya has been fragmented at best, and contradictory at worst. Italian PM Silvio Berlusconi – one of the few EU leaders with some clout in Libya – initially said that he didn’t wish to “disturb” Colonel Gaddafi since the situation was “evolving”. Czech Foreign Minister Karel Schwarzenberg maintained that the EU should not "get involved too much" because, "If Gaddafi falls, then there will be bigger catastrophes in the world”, though he later said he had meant something else. In stark contrast, Finland, France – and in more careful language also Germany – have called for sanctions to be imposed on Gaddafi, including a travel ban and a freeze on his and his family’s assets, something categorically rejected by Italy and a few other countries. Still others have spoken in terms of general condemnation but proposed no concrete action, a group including Britain so far. 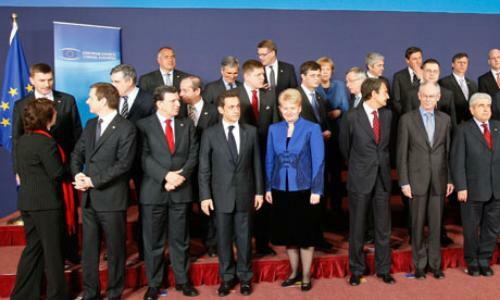 Meanwhile, no one is paying much attention to the EU’s alleged foreign policy chief, Catherine Ashton. It all feels awfully familiar. Does the absence of a common EU stance matter? I believe it does. While it’s true that the EU’s leverage in Libya and some other parts of Northern Africa and the Middle East is very limited, when Europe does pull together it can actually exert influence in its backyard. Enlargement remains the EU’s greatest foreign policy achievement made possible through a mix of aid and trade incentives. The UK should throw its full weight behind German, French and Finnish calls for sanctions, including an EU-wide travel ban on Gaddafi and his family, as well as a freezing of their assets across the bloc. Other possible responses, such as imposing a no-fly zone over Libya, should also be explored. The Colonel’s delirious speech yesterday – and his son’s comments that the family will fight “to the last bullet” – have confirmed that Gaddafi ranks amongst the Mugabes of this world (if anyone for a second thought otherwise). Finnish Foreign Minister Alexander Stubb put it best when he said that "How can we on one side look at what's going on in Libya, with almost 300 people shot dead, and not talk about sanctions or travel bans, and at the same time put travel bans and sanctions in Belarus?". EU-wide sanctions could hurt Gaddafi – financially and politically – but waiting for too long will lessen their impact. In terms of responding to the challenges in the wider region, David Cameron is absolutely correct in calling for radical reform of the EU’s neighbourhood policy, which together with other European programmes (such as the European Investment Bank), has dished out billions to the region, with few strings attached. In future, no reform on the human rights front should mean no cash. At the same time, the EU needs to use other incentives and tools to promote long-term democratic and economic transformation in the region. For example, the EU should consider opening up its markets to more goods from North African countries on the path towards democracy. This should include agricultural products, which at the moment face a patchwork of tariffs in various guises before they can enter Europe. These barriers are contributing to rural poverty in North Africa and therefore instability. The UK is in a strong position to spearhead such trade reforms. To give with aid on the one hand and take away through trade restrictions with the other makes no sense. Alas, it’s symptomatic of the inconsistency that too often characterises the EU’s relations with the outside world. The Libyan protesters’ push for change presents an opportunity for Europe to put this right. Remember the EU's banking "stress tests", which were supposed to determine the health of the key financial institutions across Europe? The tests, that were published last summer, infamously cleared all Irish banks. Only a couple of months later, two of these banks were forced too seek help from the Irish state to avoid bankruptcy, which in turn forced Ireland to apply for a bail-out. To say that this episode exposed some deep flaws in the stress tests is an understatement. One problem was clearly that the tests weren't stringent enough. Banks were deemed by regulators to need only €3.5 billion of new capital - about a 10th of the lowest estimates that were out there. Now a new round of stress tests is due to begin, and European Commissioner Michel Barnier has just informed us that the EU will announce the methodology next week. In November, in the midst of the embarrassment about the Irish crisis, his Director-General Jonathan Faull declared that next time, it's going to be serious. He maintained that the new round of stress tests would be “demanding”, with the European Commission pushing for the tests to also assess liquidity of financial institutions (which seems like a pretty fundamental criterion). This is actually a hugely important excercise. Europe will never get out of its euro-fuelled slump unless its banks come clean on their exposure to debt in various forms. Well, there are crucial details of the tests that aren't known yet, but EU leaders and regulators haven't inspired confidence so far. The European Banking Authority, that will carry out the stress tests, has already declared that the results of the liquidity checks (which will not be part of the stress tests but of separate risk assessments) "will not be published". The German government and Bundesbank have also resisted transparency, with Finance Minister Schäuble warning that "to prevent stress tests from producing more damage than good, we are ready to consider and discuss what of the tests will be published and what not." This is of course a tricky balancing act - you can easily foresee an immediate run on a bank following stress tests results that aren't favourable. But then again, trying to hide the problem isn't a solution either. And here we see the most contentious and problematic issue of them all - should a possible future restructuring or sovereign default involving, for example, Greece, be one of the test scenarios for banks? European Central Bank President Jean-Claude Trichet appears to say NO, it shouldn't. distinguishing between the trading and the banking books could mean that the tests will ignore the majority of banks' holdings of sovereign debt, since most Eurozone government bonds are held on the banking books. This is critical since the debt and solvency crisis facing the eurozone is so intimately linked to the fate of Europe's banks that it's now impossible to separate the two. Clearly, one of the main fears of a possible eurozone default - or even break-up - scenario is the losses that European financial institutions would suffer, which in turn could take Europe right back to 2008 (or in the case of Ireland, 2010). Taxpayers would again be forced to step in to avoid a complete meltdown of the financial world as we know it. The lesson from the most recent crash must clearly be that financial institutions and governments alike need to plan for the worst. Even if EU leaders don't believe that a default or break-up is desireable or likely, the worst thing they could do is not to consider it. Kicking the can down the road isn't a policy. Nor is burying your head in the sand. An internal commission newsletter reveals what European Commission President José Manuel Barroso thinks about criticism of the pay and perks enjoyed by EU staff. "The European civil service is often attacked for its apparent 'privileges' when this is not the case and I am always defending this." Adding that he "cannot accept populism against the European civil service", while paying tribute to EU officials, describing them as a "great asset to Europe". Only today, Danish newspaper Politiken reported that on average, salaries across Europe have fallen by 5% since 2008, while for EU officials they have increased by 4% during the same time period. One in five EU officials has an annual salary of around €135,000, or more - which seems high even to us. Between 1,100 and 1,600 make more than the Danish PM. It would be strange if media did not report on this. Barroso should take a stroll down the hallway in the Berlaymont building and have a chat with his colleague, Budget Commissioner Janusz Lewandowski, who understands the need to cut at least some of the EU institutions' expenditure. Over on Comment is Free, blogger Joe Litobarski has written a piece on the recent murmurings that Labour is considering backing a straight in/out referendum on Britain’s EU membership (an idea the Lib Dems committed to at the last election). • The EU’s raft of economic regulations has had a huge economic impact on the UK; Open Europe’s research has shown that complying with EU regulations has cost the UK £124 billion (£4,912 per household) since 1998. In the context of the perilous state of the public finances this is an exceptionally heavy burden. • EU initiatives in the field of crime, immigration and asylum, clearly affect UK citizens; as we have pointed out here. • Another example of how EU regulations can directly affect the lives of ordinary citizens is the EU’s Common Fisheries Policy. The great fish fight campaign broadcast recently on Channel 4 showed how the CFP has simultaneously been an environmental catastrophe, endangered the livelihoods of fishermen and pushed up food prices for consumers; hardly a glorious hat-trick and one that people clearly responded to. We could of course go on, but this ought to be sufficient proof of the disingenuous claim that Europe is a distant concern to the majority of people in the UK. It looks like the UK is not the only country where the confusing and expanding powers of the European Court of Human Rights and EU's European Court of Justice are testing nerves. Marc Bossuyt, the President of Belgian Constitutional Court, has, for the second time, fired a warning shot at both the ECHR in Strasbourg and the EU's ECJ. In a speech welcoming his Francophone colleague, he laments that the two European courts are taking on more and more powers by extending their competences, and warns that this is creating a serious threat of a "government by judges". With the EU set to sign up to the ECHR this issue is only going to get more confusing (as we have already commented). With the wide variety of rights legislation at the European level continuing to expand, the inevitable overlap and possible conflict between the two courts will make the job of national governments and judges across Europe much harder. Collisions such as the one seen over prisoners' voting rights will become increasingly frequent, and it is not just the UK that is coming to this realisation. This was an opportunity for Europe to pull its weight in Afghanistan in a discipline and skills area where it had great expertise. In this, despite the dedication and risks taken by those on the ground, the EU’s Member States have not yet succeeded. Not only was the resource allocation of 400 staff in practice woefully inadequate for this important task, the fact that even those numbers have never been met has undermined the reputation of the mission. It is the same familiar story of the EU's inability or reluctance to meet its rhetorical commitments on foreign policy with boots on the ground or adequate resources. The mission, which is due to cost €54.6 million in 2010-11, is at serious risk of failing to meet its aims with 70% of Afghan police remaining illiterate. There also appears to be little or no cooperation with Nato and a lack of a strategic timetable: despite deadlines for military withdrawal set at 2014-15, the EU's policing mission is expected take another 5 to 10 years to achieve its objectives. It is far from clear that such a mission could continue after the bulk of troops have returned home. The Lords argue that, "The planned size of the EU mission of 400 was always too small to make a major difference to civilian outcomes in Afghanistan." But even this modest commitment of man-power "has never been met, with numbers in the high 200s being typical." The result, argue the Lords, is that the mission "illustrates EU weakness rather than strength." As we have noted before, building institutions and making empty commitments an EU foreign policy does not make. The Chancellor has put Europe on notice that we can't afford not to put Europe's house in order. The UK government is talking up EU budget reform, which can come back and bite them if they fail to deliver (remember the budget freeze promised by Cameron, which sort of back-fired? ), but is also showing political will to get something done. That's a good sign. 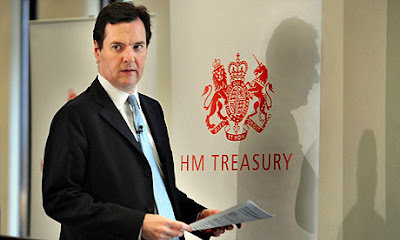 Osborne was joined by Sweden and the Netherlands in abstaining in the vote. The reason for the Dutch absention was, as the country's Finance Ministry bluntly put it, that "€2 billion has disappeared" from the EU budget, which strikes us as a pretty valid reason. Last year only the Netherlands abstained from the budget vote, meaning that we're looking at progress this year. With this rate, all member states will refuse to sign off the annual budget by 2022 or 2016 (depending on how optimistically you count). We're not exactly holding our breath though. EU ministers and MEPs have done something very sensible: agreed on an EU-wide patent. 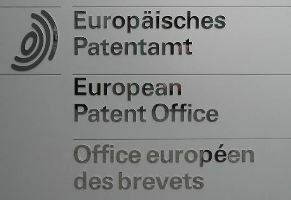 According to the Commission, obtaining a patent protection for all member states in the EU is currently around 15 times more expensive than obtaining patent protection in the US. And for a change, their estimate might actually be about right. The absence of an EU-wide patent is a massive obstacle to growth and innovation in Europe - and a barrier for fledgling SMEs in particular. Given all the regulations pumped out by Brussels every year - many far from essential - it's surprising that it has taken so many years for EU leaders to agree on something that instantly can have such a positive impact on Europe's economy and competitiveness. But it's welcome nonetheless. Not everyone is happy though. Spain and Italy oppose the proposal, feeling snubbed as the EU patent will primarily be translated into English, German and French (who cares about competitive disadvantages for Europe against the rest of the world, eh?). Spanish and Italian opposition means that other member states will press ahead with a patent under so-called structured cooperation (which allows at least nine member states to take a proposal forward even if some other countries oppose it). The benefits of this proposal aside, we now await a rash of media comments on how Spain and Italy will be stuck in the EU's "slow lane" on innovation. Because, surely, media's two-speed Europe analogy cannot only apply to the euro? It's a failure of respect between the EU institutions. As ever, there's more to two-speed Europe than what meets the eye. Regardless, well done EU ministers and MEPs for finally pulling your fingers out. First, Mr. Bini-Smaghi showed how plan B would create direct "wealth effects, a credit crunch, social/political repercussions", etc. None of that is disputed. Hardly surprising, he expressed his preference for plan A, claiming it "is painful, but most likely it is less costly than the alternative." (emphasis added - it's interesting to note how he qualifies that statement). So if the necessary budget surpluses cannot be achieved then debt must be ‘reduced’, assuming this can be done successfully is assumption 2. 1 – Although a large number of bonds are being held by the ECB (around €60 billion nominal value) just buying these bonds back at a discount will only reduce Greece’s debt burden by at most 4.15%. Not to mention the fact that the ECB has stated that it plans to hold all bonds to maturity. 2 – Therefore bonds would have to be purchased on the secondary bond market or in reverse auctions. It also seems that many banks are holding bonds to maturity to avoid declaring losses on already fragile balance sheets. But even if they were willing to sell it might not help. As we have already said: "the sudden increase in demand for Greek bonds, as a result of Greece itself having a €50 billion pot of money with which to purchase its own bonds, could actually lead to an increase in prices". If the debt were cut by one-third, the primary surplus would still be relevant. In other words, the ECB is relying on two pretty heroic assumptions. Greece needs find around €148.6 billion to refinance its debt by the end of 2014(not including the cash needed for interest payments), according to the Greek Ministry of Finance. Dreaming the debt away won't work. Bini-Smaghi went on to say that in any case, "growth is key", noting that in order to restore competitiveness, this will need to happen "mainly through domestic adjustment". He makes a list of all kinds of laudable measures that are needed for the Greek economy to grow again, ranging from" deregulation of transport and energy sectors" and "opening up of closed professions" to "increase in retirement age to 65". Assuming that this is economically and politically feasible in Greece is assumption 3; in this case he adds no caveats. Given the well documented political unrest in Greece and the significant strength of vested interests this seems like a very large assumption as well. The country has no doubt come some way - but it still has a massive distance left to travel if it wants its economy to become sustainable. And as an indication of the difficulties ahead, over recent days, we've heard of pretty stiff opposition from the Greeks to the proposed EU-IMF privatization plan (which could free up around €50 billion in an ideal world). A spokesman for the Greek government captured the mood: “We asked them for help...not to meddle in our internal affairs” (more on this here). Even if the first three assumptions were proved right, and all their goals achieved there is still one more implicit assumption to this whole discussion. It is that once this is all done, the eurozone (specifically the one-size fits all monetary policy which could facilitate boom-and-bust cycles or wipe out achieved competitiveness gains) will not lead Greece down this road again. Assuming that all of these measures will solve Greece’s long term problems within the confines of a monetary union is assumption 4. Interestingly, Bini-Smaghi gave another speech recently commenting on precisely this issue, labelling moves towards a political union of eurozone countries "risky". Instead, he said, stronger financial supervision should be pursued in order to stop boom and busts cycles. a system of rules and procedures which binds the financial system, in the same way as the Stability and Growth Pact binds national fiscal policies. The SGP has proven, shall we say, difficult to implement in practice, begging the question why a system for financial supervision based on the same model should be any more succesful. The point here is that the ECB is throwing around a huge number of assumptions. A business plan being this speculative would never make it past the board in any company (well, perhaps a few). But in the eurozone this is apparently called Plan A. If the ECB was to re-consider its assumptions, would it also have to re-consider whether plan B might actually be an alternative? It adds that "the departure of Axel Weber undermines the trust in the stability of the euro"
Parliament’s stance against the ruling by the European Court of Human Rights to give prisoners a vote has again inspired UK commentators to take a closer look at ‘Europe’. The right of prisoners to vote is an ECHR issue – not an EU one (the ECHR is not an EU institution as we're always keen to point out). However, it’s right to consider the influence and mission creep of the ECHR in the same discussion as the influence of the EU itself - for a whole range of reasons. As we’ve argued before, on rights legislation the two are now linked and both suffer from an inherent tendency to expand their own powers into new areas. And in terms of the politics and perception of it all, for most people in Westminster and beyond, there’s little difference between the EU and the ECHR, making it extremely difficult to unbundle the issues in media and political discussions (and given that even senior judges have a difficult time unpicking the patchwork of human rights legislation that exists in Europe today, the blurring of the ECHR and the EU in public perception is more rational than what EU communication-types and others realise). And there has been no shortage of hard-hitting commentary. The Tories try to keep their newly hardened Euroscepticism under wraps when dealing with their Lib Dem colleagues, who remain committed to the European project. But even the Lib Dems have been shocked at how much influence Brussels has on decisions that should be taken at a national level. Nick Clegg was appalled when officials told him that the EU wouldn’t allow VAT to be set at a local level. Europe was easier to characterise as a fringe issue, not so now….Cameron thought he’d have to play along, even though it made him “physically sick”. But in perhaps the most useful thing the House of Commons has done for two decades, it decided otherwise last week in a free vote. And what are the judges of Strasbourg going to do? Invade? A healthy precedent was established last week. Britain has rejected that old argument that we have no choice. We do. Parliament is sovereign. We can reject as many Euro laws as we like: from Brussels, Strasbourg or both. Inevitably, there will be more court rulings from the ECHR and the ECJ (one coming up on pensions for example) - in addition to new Directives and Regulations from the Commission - which will be percieved as interfering in national areas where they don't belong. This isn't the last clash we'll see, but it's a signifcant one. And hats off to Parliament. This time, MPs did their job. Assumptions in the British media are funny sometimes (though other countries' suffer from this too) - not least amongst those who claim to take the intellectual high-ground on the European Union. Note the expressions "mainstream", "slow lane" and waving "goodbye from the platform" - without any definition or further explanation - to present an underlying assumption as if it was a matter of fact. 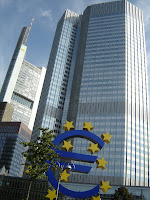 The assumption is that, looking ahead, not being in the eurozone is synonomous with being left on the periphery, in the ‘slow lane’ or even standing still - an assumption which arbitrarily puts further integration in and of itself above, for example, economic growth as the main determinant of what constitutes the EU's "fast lane". 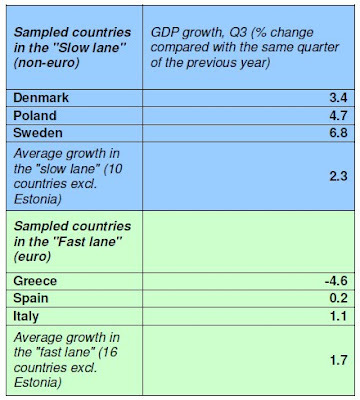 To illustrate: Under the definitions in the articles that are cited above, countries such as Poland, Denmark and Sweden are confined to a life in the EU's "slow lane", while Greece, Spain and Italy, for example, can freely enjoy the "fast lane". So nothing on growth, employment rates, demographics - factors that seem pretty important to consider in any discussion about "fast" and "slow" in Europe...? Not quite the same picture, is it? Now, the articles are of course correct in that there are challenges for the UK, and other non-euro states, arising from the eurozone crisis and the drive for more economic integration in its wake - including the risk that the centre of gravity in EU-17 now moves in the protectionist direction. This is a valid discussion. But these challenges (and opportunities) are far more interesting than what can captured by a simplified - and arbitrary - reduction of the issue into 'fast' and 'slow' lanes. And to continue the illustration, look at how Sweden - a non-euro member who, for instance, has also vetoed moves towards common EU family law (=the slow lane presumably) - has strenghtened its position in Europe over recent years. Why? Hint: the economy. Without rehersing the pros and cons of the Single Currency, the question is also how being part of what increasingly looks like a debt union automatically puts you in the fast lane. Throwing around assumptions and reducing multi-facetted discussions into oversimplified cliches is lazy journalism. 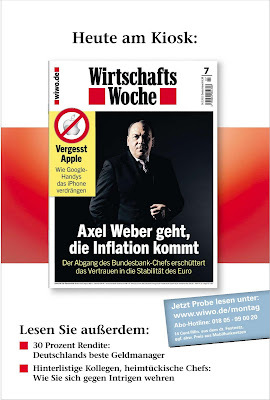 Axel Weber's elevation to President of the European Central Bank was long seen as a mere formality - a natural step towards the realisation of a"German-speaking euro". So reports in today took plenty of people by surprise, including Chancellor Merkel and the markets. Apparently, the Governor of the German Bundesbank has decided to pull out of the race because, in the words of a European official quoted by the WSJ, he has "other plans". Some papers suggest that these plans could involve a top job at Deutsche Bank. The situation is somewhat confused. 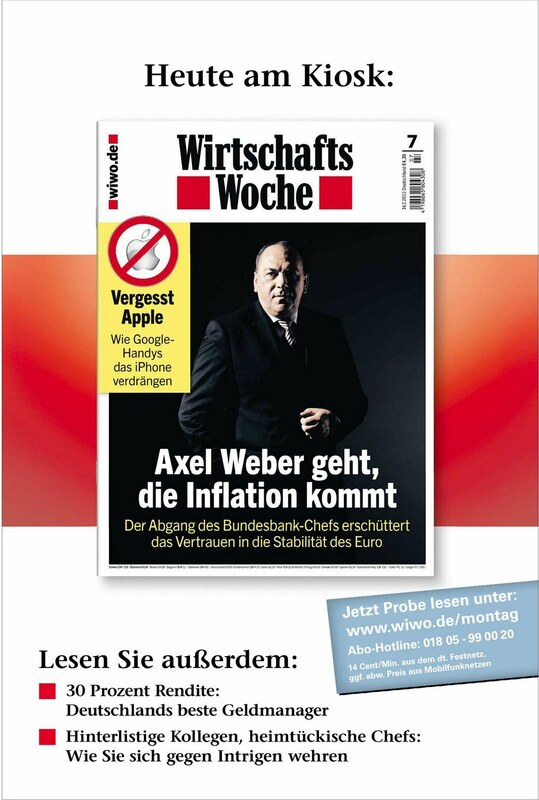 According to Bundesbank sources, Weber might still want to run for ECB-President. Weber himself has said he will not make any comments until he discusses the issue with Merkel. But our guess is that Weber has thrown in the towel. First, Weber doesn't have lots of friends in the eurozone's "periphery" countries. He's a fierce (and vocal) opponent of the ECB's purchases of junk bonds from Greece, Ireland & Co. And he's probably keen on raising interest rates to curb inflation, because, at the end of the day, this is what the ECB is there for. But such a policy would be poison for vulnerable economies in the eurozone, that are trying bounce back from the economic downturn. Germany may also have decided that sacrificing Weber's ECB Presidency was a price worth paying in return for France's backing for the "pact for competitiveness". So now what? Merkel is said to be lacking a "plan B". The only viable alternative would be Klaus Regling, the chairman of the European Financial Stability Facility, but he has no intention of quitting his current post. Sarkozy would presumably be quite keen to replace Trichet with Christian Noyer, the Governor of the French Central Bank. Or maybe with IMF Director Dominique Strauss-Kahn (simultaneously neutralising a possible rival in next year's French Presidential elections). But nationality matters, and it's very unlikely that another Frenchman is appointed in place of Trichet. Italy's Mario Draghi has therefore emerged as the strongest contender. He has been doing a decent job in protecting Italian banks from the crisis, and his international reputation as Chairman of the Financial Stability Board is up to scratch. He's also considered more diplomatic than the hawkish Weber. However, his previous position at Goldman Sachs could prove to be an obstacle. In addition, as ECB President Draghi would also chair the European Systemic Risk Board, the new EU watchdog in charge of macro-prudential supervision. 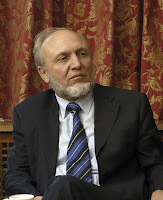 But Italy has already secured the chairmanship of the European Banking Authority (Andrea Enria). There are four new financial supervisors in the EU, and giving two of the chairman positions to Italy might prove too much, especially as the UK, Germany and France got none. The situation remains fluid, in other words. Trichet is leaving the Eurotower in October and what's clear is that the eurozone can hardly afford a row over his successor. With MPs debating voting rights for prisoners tomorrow, there has been plenty of media attention focussed on the European Court of Human Rights (ECHR). But what does this have to do with the EU? Despite the often repeated misconception, the ECHR and the EU are separate beasts and the UK could potentially withdraw from the ECHR without having to leave the EU. However, it is also wrong to say that “the EU has nothing to do with the ECHR”, which a surprising number of commentators have over recent weeks. As the briefing we published yesterday shows, future EU accession to the ECHR, the EU’s Charter of Fundamental Rights and the growing amount of EU rights legislation is blurring the lines between the two to the extent that is becoming increasingly difficult to separate them. EU accession to the ECHR (the negotiations started last year) could allow ECHR rulings to impact on the UK through the back door. The UK would be forced to accept any EU law modified in response to an ECHR ruling. The case law of the EU's European Court of Justice in Luxembourg and the ECHR in Strasbourg is also becoming increasingly intertwined with the ECJ referring to the European Convention on Human Rights more regularly. So, even if the UK Government does magically reach a compromise with the ECHR this will not be the end of it. The confusing array of rights at the European level is only going to become more so and the types of legal wrangling we are seeing over prisoners voting rights is only likely to occur more often. A discussion on the need to bring back some control over human rights legislation cannot be limited to the ECHR alone, but must, as a matter of fact, also include the EU itself. A start would be to seek a cast-iron opt-out from the Lisbon Treaty's Charter of Fundamental Rights - which, incidentally, the Conservatives promised ahead of last year's general election. So far the only thing that is for certain is that the consequences of this legal patchwork of European rights are as clear as mud. European Council President Herman Van Rompuy got another hostile reception at the European Parliament yesterday. Briefing MEPs on last Friday's summit of EU leaders, he did his best to play down the disagreements that dominated the summit. No matter how meagre the results are, we always get reports of how smooth everything went. We need more honest declarations which pinpoint the problems. We'll not pass judgement on whether the USSR bureaucrat swipe is an improvement on the "damp rag" comparison made by UKIP Chief Nigel Farage last year. We've already looked at the reaction from some of the European press to the Franco-German "pact for competitiveness". But what about European leaders? Well, as has been widely reported, Paris and Berlin may find it a bit more difficult than usual to get their way. Why do you have to demonstrate a division? Are the rest of us standing in your way? We will not allow our social model to be undone. I can't really find a reason why abolishing the indexation of wages should improve the competitiveness of my country or the euro area. I don't even think it's possible that the EU sets the retirement age. I categorically reject the thought of an EU decision to intervene in national constitutions. The idea that this would be a precondition for being a part of the German rescue plan is not attractive to me. European Council President Herman Van Rompuy will now try to find a compromise, suitable to all eurozone leaders. An extra eurozone summit is planned, possibly for March 11, then the aim is to have a deal ready at the EU summit by the end of March. Last week's EU summit, saw the Franco-German "pact for competitiveness" - a raft of proposed rules on wages, pensions, spending and taxation to strenghten discipline in the eurozone - run into some serious opposition. Not surprising given that the plan effectively demanded that permanent, cast-iron rules, rather than votes in democratically elected national parliaments, determine key policies on spending, taxation and pensions across the eurozone. Mariano Rajoy, leader of the Spanish opposition Partido Popular, summarised the underlying problem: “As a Spaniard, I don’t like to be told what I have to do by outsiders”. Both the content (such as breaking the link between wages and inflation) and the process (France and Germany hammering out a deal behind closed doors with little input from anyone else) caused plenty of mutters from the other EU leaders. The Merkel-dominated plan would lay down the new economic rules in exchange for injecting more money into the eurozone's rescue fund, but is now unlikely to be adopted in full. Here is a round-up of what the press in the so-called 'peripheral' eurozone countries - the politically correct epithet for PIIGS - said last week about Iron Angie's ultimatim. The way in which decisions are being forced through in the states of the Eurozone and EU nowadays is nothing short of a coup d' état. One may or may not agree with Merkel's proposals [...] But what is absolutely unacceptable is this method of foisting these measures on the states. The Spanish economy needs to change its growth pattern; save more and increase productivity. To achieve this, many changes are needed, and one can also discuss what Merkel proposes. But in the end, each country must choose its own formula to boost productivity. [A common] European economic policy is running. Angela Merkel is driving it. 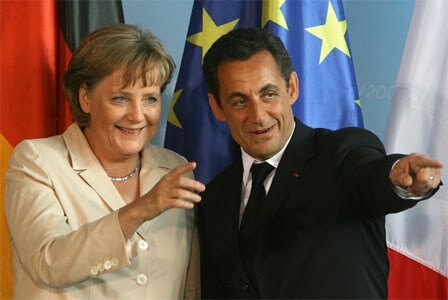 If all goes well, the Franco-German pact for growth and competitiveness will not make any mention of imbalance corrections for countries running excessive trade surpluses: no mention of the fact that Germany might be forced to boost its internal demand to favour growth in the rest of Europe. However, a blueprint will be provided for the gradual Germanisation of Europe [...] In other words, the European economic government always invoked by France, but all in German sauce [...] Will other eurozone countries follow? Bets are open, but if they want to stay in the euro area they will not have much choice. Is it just us, or does it seem as if the couple at the end, Ashton and Berlusconi, don't quite know what to talk about...? EU leaders meet today in a bid to patch up the eurozone (while also dealing with other pretty complicated challenges such as Egypt and energy security). Dutch daily De Volkskrant yesterday had a feature ("Leer eerst eens je broek op te houden") looking at how the atmosphere in the EU's diplomatic circles is becoming increasingly abrasive and more tense. The paper claims to have obtained various statements from diplomats, making clear the eurozone crisis and ongoing bailouts are complicating relations within Europe. it is incredible: these countries are still posturing. Then I think to myself: well, well, perhaps you should learn how to stand on your own two feet first. it's their own fault [why should] hard working Dutch and saving Germans [pay the bill] for the Greeks, who strike continuously, even now when they have received €110 billion in emergency support from us. 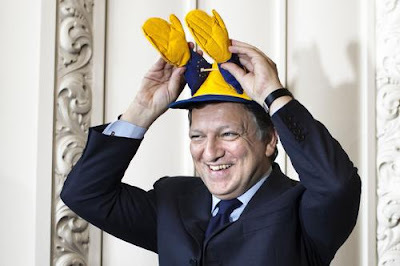 whose money is Barroso actually talking about? Is it his own? No! It's the money of the Germans, the Dutch, the French, the Finns. Is it so crazy that we get frustrated? the word PIGS alone. The image it conjures of responsible Northerners having to pay for a bunch of lazy people sitting under a palm tree by the Mediterranean. That leaves scars. Most citizens in Southern European countries are not to blame for the economic situation in their country. But they are being depicted as the trash of Europe. I see my German and Dutch colleagues getting more and more authoritarian, as if they are in charge. Even the Finnish, who normally don't open their mouths, make interventions. (...) At the same time I get less and less involved in the discussion. I watch my words, it's like that. Our banks are down, not the German ones. Our economy is floored, not the Dutch one. We lost, then you better keep quiet. It's one thing to accept that Germany and France are important for the EU. But it's a whole different thing to accept that they impose an ultimatum. Frustration is growing with the Franco-German motor, which is increasingly looking more like a tank. "If the other 25 member states would please sign here", is how a Commission official summarises the mood. The country is after all a bit of an open air museum. That you can keep up such grandeur with a mummy state and a couple of car factories is causing jealousy, but no annoyance or fear. was a communication disaster (...) It looked like a diktat. But without Deauville we would still just be talking. they say they are being belittled, or put to the side. The whole Commission is concerned. We should really watch out. This leaves marks. The blood is sticking to the walls. He notes, however, that there won't be a revolt because of the upcoming discussions on the EU's long-term budget: "they won't bite the hand that feeds them." Pew! Some people claimed that European Monetary Union was a “dream”. If so, Europe is now waking up to a nightmare. The euro will aggravate the political tensions to the extent that economic shocks, which beat countries in different degrees but which could until now be facilitated through exchange rate adjustments, will change into political controversies. The torrent of EU justice, police and immigration laws keeps on coming and the Government keeps on signing up to them. Home Office Minister James Brokenshire today told the House of Commons that the UK has opted in to the EU's cyber-crime directive. Now leaving aside the merits or drawbacks of the new law in question, this decision demonstrates the complete lack of democratic accountability that we've been highlighting over the past weeks and why we've been pushing for MPs and the public to be given more power under the EU Bill. Not only did MPs not get to vote on whether the UK should sign up to this particular directive, the Government broke the European Scrutiny Committee's 'scrutiny reserve' to do so. MPs on the ESC considered the proposal late last year but did not clear it because they felt there were still questions for Ministers to answer about the plans. The directive sets "a maximum term of imprisonment of at least five years" for certain cyber-crime offences. But there is another technical but hugely significant point. We've explained before that in 2014 the UK has the right to opt out of around 90-100 EU policing laws that came into force before the Lisbon Treaty took effect. On the other hand, if the Government decides to remain opted in, these laws will fall under the full jurisdiction of the European Court of Justice for the first time. The Government has said it will put this hugely important decision to a vote in both Houses of Parliament - something that we welcome. However, the directive the Government opted in to today 'repeals and replaces' a pre-Lisbon law, meaning that there is now one less EU law the UK can opt out of in 2014. It also means that the Government has today handed jurisdiction over the area of cyber-crime from the UK courts to the ECJ. And all without Parliamentary debate or approval. The Minister said that by giving an oral statement to the House he was acting in the spirit of Parliamentary scrutiny but this is, quite frankly, nonsense. What use is scrutiny after the event? The Government has made a decision and there's nothing anyone can do about it. Today's statement was just to put that fact on record. Last month, Europe Minister David Lidington made a statement committing the Government to observe Parliamentary scrutiny and give MPs more opportunity to have a say on EU justice and home affairs opt ins. On today's evidence it doesn't seem the Home Office got the message. To make matters worse, the Government also looks set to opt in to the EU's plans to make the telephone numbers, addresses, credit card numbers, email and other details of British air travellers available on demand to police forces across Europe. The Commission's current proposal covers flights between EU and third countries but, not satisfied with this, the Coalition wants the proposal stretched further to cover data collected on all flights within the EU as well. MPs have again been sidelined and the Government is fast losing any trust that Lidington has been seeking to build on this issue. Will Greece lightening strike twice? News of more stability in the markets are welcome, the reason underpinning them (EU leaders consider putting even more taxpayers' cash on the line to save countries that mismanaged their finances) are not - a contradictory feeling that those of us who saw this coming will have to deal with. But notwithstanding positive developments of late, there has been something very familair about the last couple of weeks - as Greece is again coming back into the spotlight. We hear increasing worries about Greek debt levels and leaked rumours over a possible restructuring combined with a bailout. It may not be as much hype, but looking at the numbers, in fact, it's feeling alot like last Spring. Leaked reports claim that EU leaders are now considering a restructuring plan for Greece's debt, which would see the country buying back some of its own debt at a cheap price, using some €50 billion from the EU's bail-out fund, in combination with a lengthening of the pay-back period of the EU loans Greece has already recieved. Greece's cost of borrowing is still around 11% for long term debt, meaning that it cannot go to the market to raise the extra cash (as that would be wholly unaffordable). EU leaders are therefore right to consider ways to restructure Greek debt. However, as we also argue in the briefing, the proposal contemplated isn't in itself much of an answer. 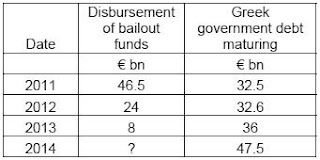 As the table below shows, even if Greece were to make it through this year, or even 2012, it would continue to face daunting re-financing targets, which, again, aren't matched by available bail-out cash. So even if the rumoured restructuring plan were implemented we estimate that Greece’s debt to GDP ratio would still top 145% in 2011, though if private bondholders agreed to take part in the plan (which is far from certain), this could be slashed considerably more. For Greece to get back on the path towards sustainability its debt to GDP ratio needs to be below 100%. This, in turn, would require a write off of more than one-third of all Greek debt. A substantial jump from the 2.4%-4.2% expected with the current plan (without private bondholders included). There is also no indication as to how Greece would deal with the €148 billion of debt maturing by 2014, nor the interest payments on its debt, which accounted for a whopping 20% of all government expenditure last year. The scheme proposed by the eurozone leaders also fails to address some other familair problems. Greece has a massively overvalued currency, poor growth prospects and little international competitiveness. Until these issues are properly dealt with, Greece’s long term prospects look bleak. The markets may be looking up right now - which is good news - but for Greece, alas, little has actually changed, despite some considerable austerity efforts. Even with a mild restructuring/another bailout, the Greek debt crisis is likely to rear its head again. Maybe a third lightening strike will force eurozone leaders to try something different. "Speaking with one voice" has consistently been the mantra or motto of those in favour of a single EU foreign policy. The EU Foreign Minister post, occupied by Catherine Ashton since it was created by the Lisbon Treaty, is supposed to be the mouthpiece. So far Ashton's statements have been frequent (nothing seems to occur without some comment, however anodyne). But with events continually unfolding in Egypt, the EU has been called on to say something meaningful. The Egyptian people have legitimate grievances and a longing for a just and better future. We urge President Mubarak to embark on a process of transformation which should be reflected in a broad-based government and in free and fair elections. ...The legitimate grievances of the Egyptian people should be responded to – their aspirations for a just, for a better future should be met with urgent, concrete and decisive answers and with real steps. There needs to be a peaceful way forward based on an open and serious dialogue with the opposition parties and all parts of civil society, and we believe it needs to happen now. Still no mention of "free and fair elections" from Ashton, two days after the initial joint letter. The Council urges the Egyptian authorities to embark on an orderly transition through a broadbased government leading to a genuine process of substantial democratic reform with full respect for the rule of law, human rights and fundamental freedoms, paving the way for free and fair elections. And there we have it, the EU is in favour of "free and fair elections". Is there a better illustration as to why the EU's fledgling foreign policy apparatus can only ever be a decorative bureaucratic exercise in finding the lowest common denominator? The EU popped into the Egyptian crisis yesterday, almost one week after the popular outbreak, to release a communiqué of predictable inanity...Being how the EU always is, it pushed the principle of precaution. There was no reference to Mubarak or his future. As we noted yesterday, Le Figaro didn't exactly describe the EU's joint-response to the crisis in a flattering way either and Charlemagne notes that the French press is becoming increasingly vocal in its criticism of Ashton and her foreign policy machine. It seems Europeans are increasingly speaking with one voice, but it's not quite what the people at the top had in mind.